Chris: After having been in the league for years without winning a championship, who can forget the performance by a certain small forward in last year’s Game 5 of the NBA Finals, overcoming naysayers and leading the Miami Heat to the championship with seven 3-pointers. Though I’ve never really considered Mike Miller one of the best small forwards ever, he did prove to have less sweaty palms than his MVP teammate, LeBron James. Joe: I think Charles Barkley was the best small forward ever, because he was unstoppable inside once he got the ball. He shot over 54 percent from the field and over 73 percent from the free throw line. The 11-time All-Star, Sir Charles has been a magnetic personality at every stop along his career and is currently a guest commentator on many forums - sports and politics. His opinion is sought by media and is always candid and entertaining. At 6'6", Sir Charles played against much taller opponents most of the time, yet he was a leading rebounder, totaling over 12,000. His girth was always large as a player, and his appetite for late night pizza is legendary, leading to the nickname of the "Round Mound of Rebound." Sir Charles was on the All-Rookie Team, five-time NBA first-team All-Star, NBA MVP, All-Star MVP, and earned over $40 million during his career. And his career continues . .
Brad: Charles Barkley is a great player and can definitely score. There is just a Hollywoodness to his game. He dominated at forward, no matter the opponent, but it was like he was entertaining rather than being a pro athlete. Ralphie: I think Charles Barkley is the best small forward ever because he was stronger and faster than most players his size. He also got a lot of awards, like the All-NBA First Team and the Second Team. He even got them 5 times. He also got to play in the NBA All-Star game 11 times. Chris: Larry Bird won three MVP awards, made 12 All-Star teams and may or may not still be playing an ongoing game of Horse with Michael Jordan for a 20-year-old Big Mac and fries. 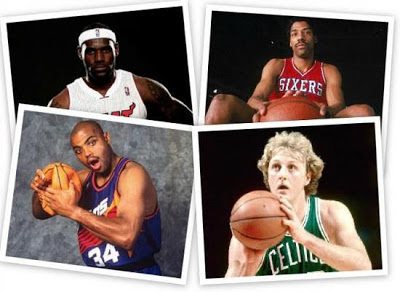 And unless one is willing to call Vince Lombardi a liar (“Winning isn’t everything; it’s the only thing”), then Larry Bird should be considered the best small forward of all time, seeing as how he has won more NBA titles than Barkley, LeBron and Dr. J combined. Although, considering the fact that Robert Horry won six titles, this makes my point somewhat mute. Never mind. Joe: Larry Bird was a great player, but his all-time shooting percentage of below 50 percent hurts his all-time ranking. Brad: I think that Larry Bird is the best small forward ever, because he was a solid player and a good team player. He was great on the court, overall, and was also a good motivating teammate. He kept his concentration on scoring and making the plays. Ralphie: Larry Bird is NOT the best small forward ever because he wasn't very good at 1-on-1 defense. Chris: If Taco Bell were to sponsor a one-on-one game between LeBron James and Larry Bird, James would most likely come out ahead, seeing as how Bird is 56 years old. However, I prefer the best player at a certain position to be willing to attempt a game-winning shot or take free throws, as opposed to passing it to another player on his team and going to find a comfortable spot in the corner to stand and watch. Ralphie: LeBron James is NOT the best small forward because he gets frustrated too easily. If things aren't going his way during the game, he gets upset about it, and it affects his game. Brad: It's not that I think he is not a contender for the best spot, it's more that he is the current best. Joe: Too early in his career. Barkley sustained a high level of play over 16 seasons, and LeBron is only in his 10th season. LeBron is great and will rank very high if his career continues as well as it has started. Chris: Having never actually seen Julius Erving play, I’ll go ahead and assume he’s not the best small forward ever. I would research this topic more, by studying the upcoming documentary about Erving on NBA TV, but I don’t get that station. Joe: Dr. J, as he was called, was a premier player and achieved many honors, but his career would have been much better if all played in the NBA. Brad: I do not consider Dr. J to be the best small forward ever. I do, however, think he is the icon of the sport. He is what every player should strive to be. He was an amazing player, both in skills and in brains. He had the respect of his teammates, and that makes for a smooth, solid running basketball force. Ralphie: Julius Erving is NOT the best small forward because he wasn't a great shooter, and he really wasn't all that good on defense. The best thing he did for basketball was to make it more popular and to make the slam dunk a big deal.